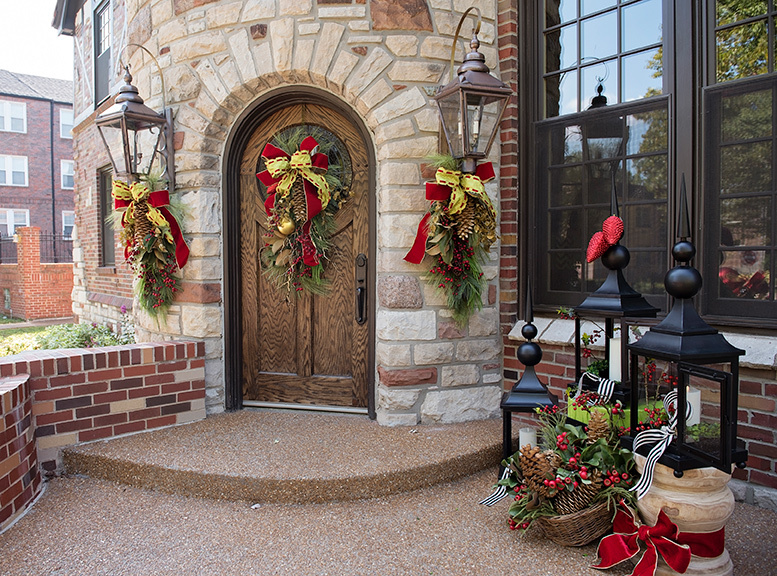 St. Louis Homes & Lifestyles asked three local design shops to put their seasonal spin on a classic Clayton exterior. The art of decorating your home for the holidays may now be just another item on your to-do list. 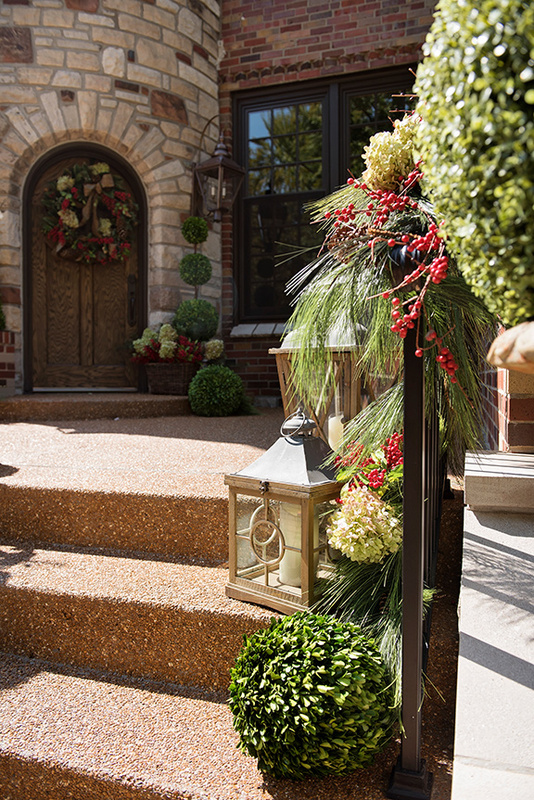 But beyond your indoor décor and outdoor lights, don’t forget about your front porch. A festive display draws in guests and sets the tone for the merriment that is about to come. 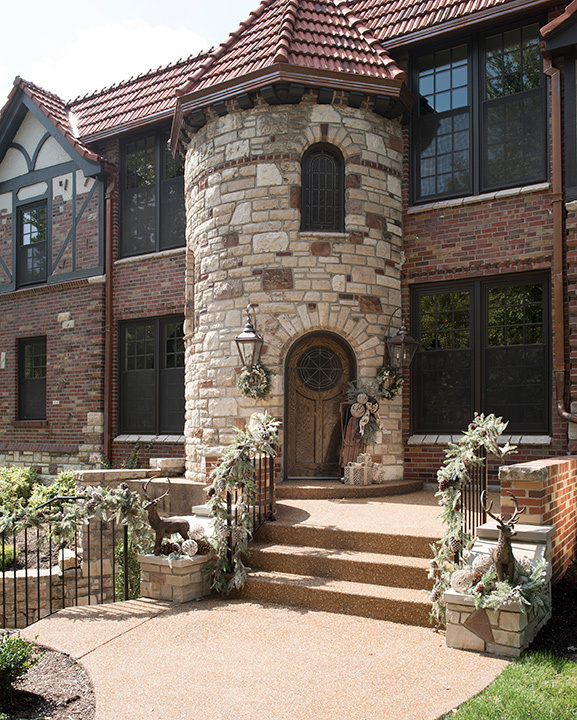 St. Louis Homes & Lifestyles asked three local design shops to put their seasonal spin on a classic Clayton exterior recently rehabbed by Period Restoration. 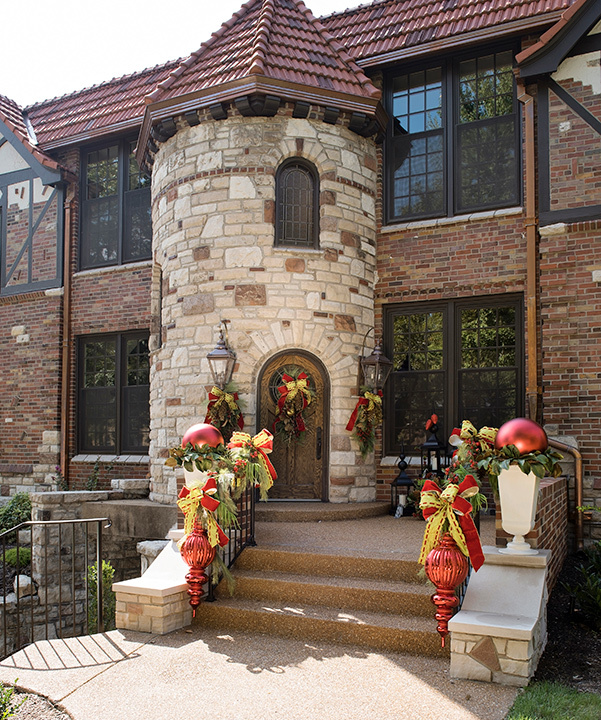 The expert elves from Mary Tuttle’s, Rusted Chandelier and The Jeweled Cottage had just 30 minutes to sprinkle their tinsel, ribbons and garland. 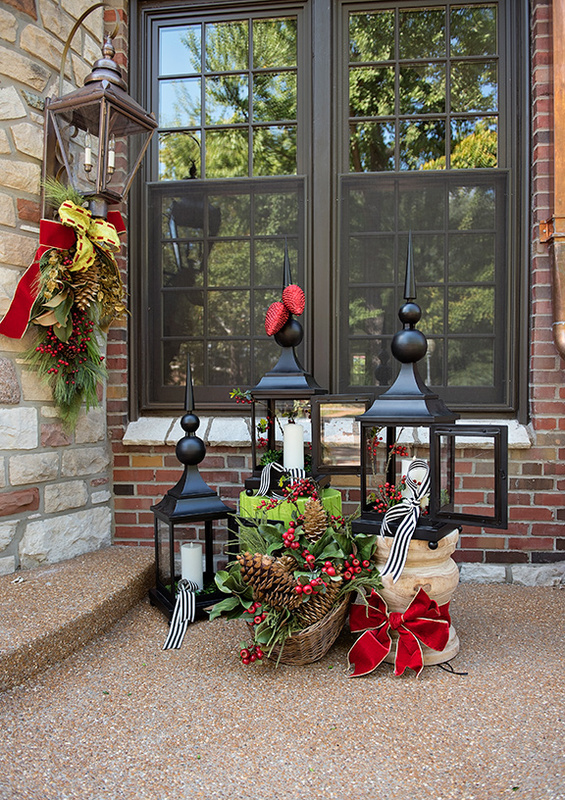 We hope you are inspired to deck the halls (or your porch) this holiday season. 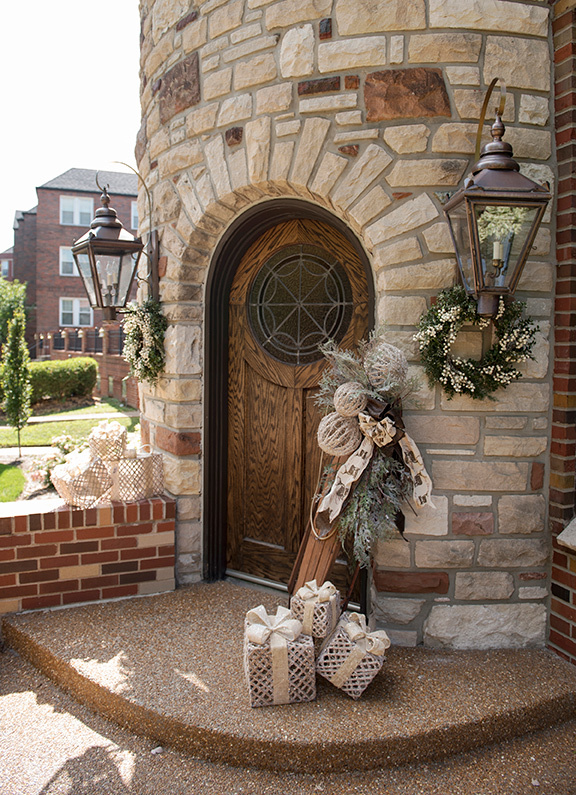 The designers at The Jeweled Cottage were motivated by the beautiful Clayton landscape when choosing the front porch décor. The nature-inspired look brings in elements of the surrounding woods with touches of sparkle. 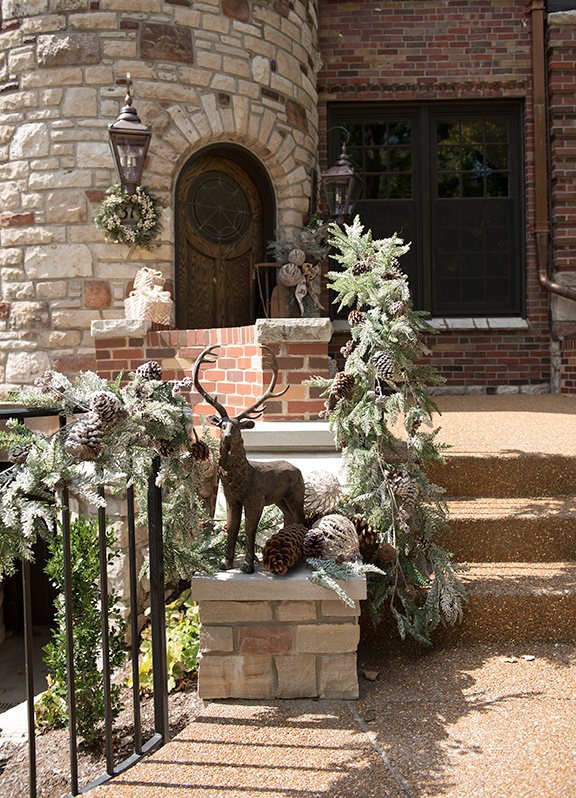 Dual wreaths wrapped in white berries hang under the lantern fixtures, and pinecones tickle the feet of two stately deer statues at the base of the porch steps. An antique sled draped in greenery gets touches of sparkle in the glittery burlap presents and balls. The color scheme is kept in natural greens and browns. A leather ribbon finishes the look, lending an unexpected punch of texture and sophistication. Rusted Chandelier selected their color scheme based off the monochromatic and darker shades of the home’s stone. Bright red and a lime green pop against the natural colors of the exterior façade. Custom bows showcase their fabulous seasonal ribbon, which includes red velvet that the designers say is so big this holiday season. 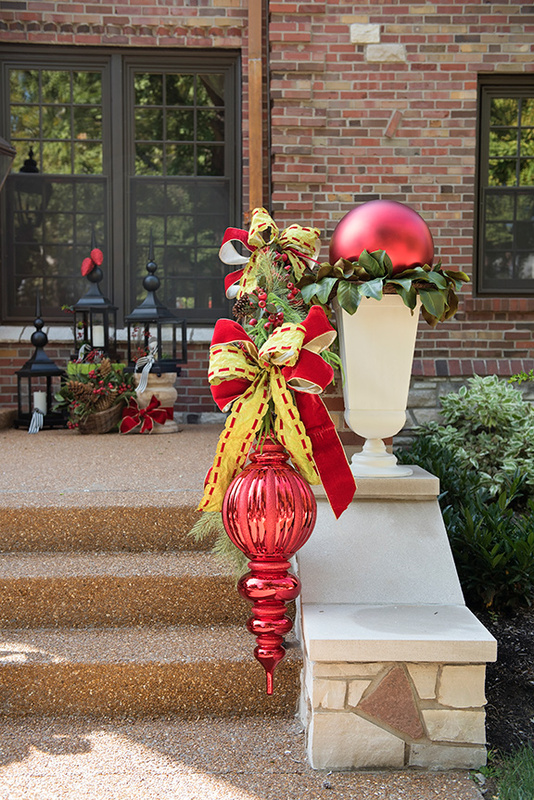 Oversized shiny red finials and bright red ornament balls add a whimsical touch. Near the door, lanterns filled with greenery and candles sit atop lime green and natural wood stools. To bring in nature, the designers mixed in pines and berries. Staying true to their signature slogan, “The Art of Living,” Mary Tuttle’s designers focused on keeping the front porch décor simple yet elegant. 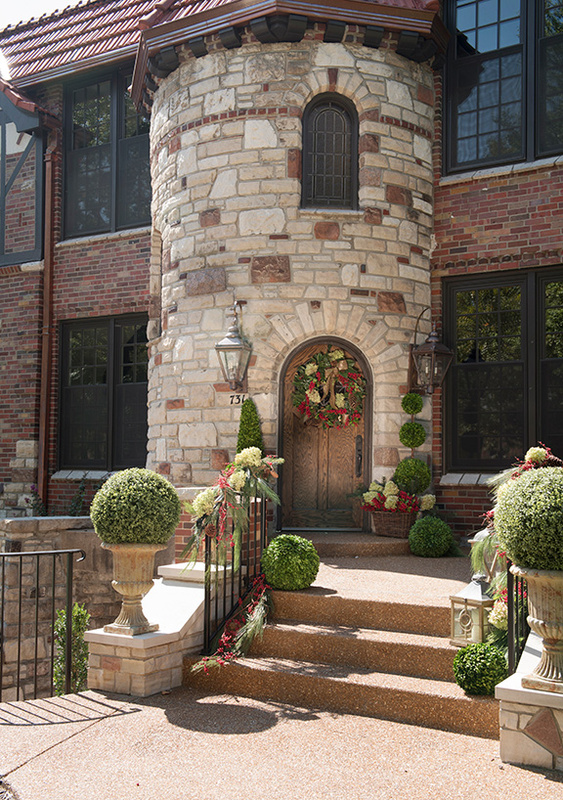 Inspired by the English feel of the home, they incorporated lots of faux boxwood foliage to complement the exterior architecture. The designers wanted the display to give the feeling of being out in the woods. 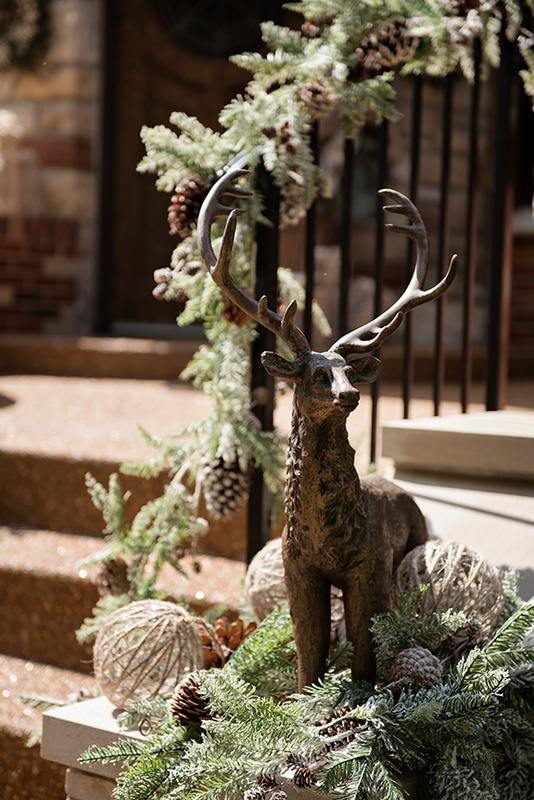 Elements like berries and pinecones mix with dried hydrangeas enhance the natural look. 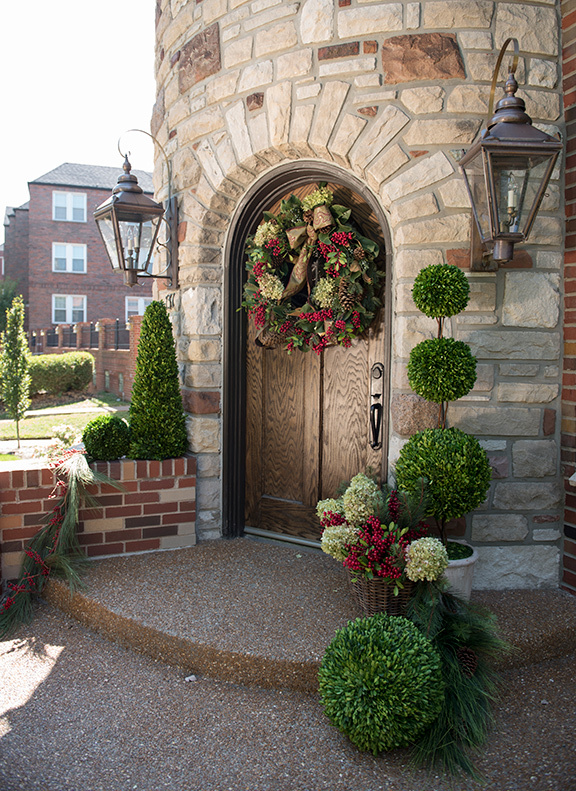 The wreath is a statement piece on the front door that repeats the natural elements found throughout. 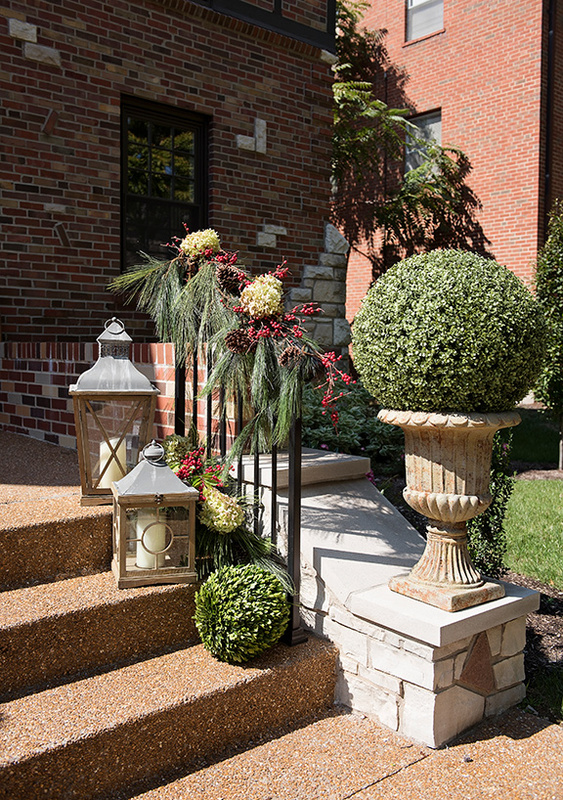 Simple urns topped with oversized boxwood flora and lanterns glowing from a single candle complete the look.